Could the Brisbane River be considered a deity? And if it were deemed a god or goddess, would it mean the community would be more reverent to this grace-ful waterway? To consider this question I turn to David Haberman's wonderful book River of Love in an Age of Pollution (2006). Haberman spent several years in India conducting ethnographic research about the people who revere the Yamuna River, the Goddess Yamuna, the Mother. For thousands of years the river has been worshipped as a divine entity but, says Haberman, recent ecological trauma has placed the river in both environmental and religious jeopardy. The Yamuna river is among the holiest in india. A sister to the sacred Ganges, the Yamuna rises in the land of high peaks, ice and snow and flows through India, into the Ganges and onwards to the sea (Bay of Bengal). But Haberman's view of this endanged river is shocking. Littered witih toxicity, the river Goddess is seriously ill. The task of his marvellous book is epic, to document the plight of the river and travel its length bearing witness to its failing health. Talking with people along the way from Hindu priests, ecologists and locals, Haberman weaves a story of resilience and deep spiritual grace. The Goddess Yamuna is the Goddess of 'exquisite love and compassion', of 'loving generosity' and 'Mother of the World' (2006:104, 107). Honouring the Goddess by immersing onself in her sacred flow is said to 'increase love' (122), to be cleansed of sin and 'evil consequences' (126), and to be healed of illness. Hearing about the Yamuna's role in healing he asks: 'One might wonder: what will happen as she who protects from disease herself becomes a possible source of disease through pollution?' (127). Haberman makes a pilgrimage far to the source of this sacred river. At the headwaters, the Yamunotri glacier, the river's water is pure, clean, clear. He calls the water here 'aquatic drops of nurturing love' (44). But as the river travels downstream the water colour changes as the effects of industrialisation, chemical outflow, agricultural pesticide and fertilizer runoff, urban development and sewerage interact. The grace and elegance of the river shifts from the beauty of the loving sacred Goddess to a sewer which 'can no longer sustain life' (81). Eutrophication from a build up of toxic contaminants suffocates the Yamuna. For example, a recent news item from India reports that just this week the Yamuna will be inundated with 30 tons of toxic paint from 300 clay idols of the Goddess Durga will be immersed into its flowing waters. The news report indicates that although there are guidelines for religious communities to follow in relation to river pollution, they are not being enforced. The outcome - the Goddess Yamuna continues to suffer. Along his river journey David Haberman meets a priest who declares that the Goddess 'is dying' (137). The priest recalls how he 'used to bathe in the river with faith when she was alive' and with a great deal of sadness adds: 'When the river is finished, life will no longer be possible for human beings'. Others argue that despite the pollution, the spiirtual power of the river is still strong. Haberman's book is a masterful lesson of reverence and worship in the face of rapid ecological decline. There is a message here about love, compassion and action. We need to love a river, an ecosystem, the Bay, the ocean, the forest, our local places. But beyond love we need to care for these environments actively. Haberman says what's needed is 'a vast outpouring of love, a mighty river of love that will nouris and sustain us while washing away the pollution that is threatening the very fount of all life' (195). 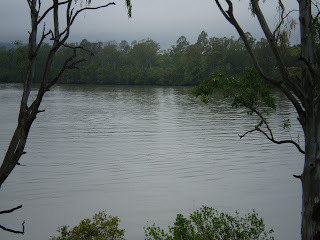 Reflecting on the need for love of and for the Goddess Yamuna brings me back to this river valley in Brisbane and to the possibility that deep reverence, honour and love can be piled upon its grace-ful flow. Haberman DL, 2006, River of Love in an Age of Pollution: The Yamuna River of Northern India, Berkeley and Los Angeles, University of California Press.